The Ten is the result of what Nike says is one of its fastest collaborations ever, with the 10 shoes designed and produced within 10 months from ideation to release. The capsule has been split into two halves, Revealing and Ghosting, which represent an evolving design technique established by Abloh. Revealing includes new versions of illustrious silhouettes such as the Air Jordan I, Nike Air Max 90, Nike Air Presto, Nike Air VaporMax and Nike Blazer Mid. Reworked by Abloh, the sneakers have been stripped-back with Nike labels and Swooshes cut and resewn in new positions, as well as the addition of red zip ties through the laces. These pared-back design characteristics were the result of the designer's first visit to Nike's headquarters last year, where he customised pairs of Air Force 1 shoes by slicing them up with an X-ACTO knife to expose their inners, before scribing slogans on them with marker pens. The one-off prototypes were given to Abloh's staff to wear at the following Design Miami, where he presented furniture for his brand Off-white. 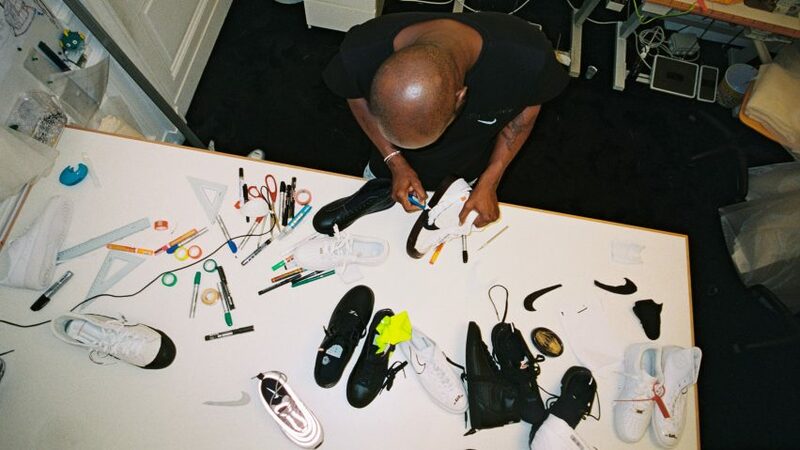 Abloh has imprinted humorous, self-referential logos on various parts of the different shoes for this release, such as "Shoelaces" and "AIR", which alludes to Nike's Air technology featured within the shoe. The second half of the collection, Ghosting, is made up of Converse Chuck Taylor, Nike Zoom Fly SP, Nike Air Force 1 Low, Nike React Hyperdunk 2017 and Nike Air Max 97. The five sneakers feature translucent uppers, giving them an ethereal, see-through appearance that inspired the collection's name. The designer, who has a masters degree in architecture, believes the decision to re-release these historically successful trainers is indicative of Nike's large impact on sports, design and beyond. "What we're talking about here is larger than sneakers, it's larger than design culture," said Abloh. "These 10 shoes have broken barriers in performance and style. To me, they are on the same level as a sculpture of David or the Mona Lisa." 36-year-old Abloh, who has also collaborated with IKEA and Kanye West, hopes that the collection can inspire other fashion designers to replicate his casual, DIY approach. “Yes, we're making a desired product," he said, "but by making a trip to your local store, and using tools you have at home, you could also make this shoe." To celebrate the release of The Ten, Nike will host “Nike Off Campus” events between 14 to 17 September at various locations in East London, featuring presentations of the full collection, plus talks between Virgil Abloh and designers, artists and musicians, who will discuss different elements of the design process. The first five releases from "The Ten" — the Air Jordan I, Nike Blazer, Nike Air Presto, Nike Air Max 90 and Nike Air VaporMax — will be pre-released at NikeLab in New York, London, Milan and Paris and Dover Street Market stores on select dates throughout September. The full collection will be available worldwide in November.